Good Friday | 30-March, 2018 for an all day long program & ICC will have it's Annual Conference with several well-renowned Speakers and Qaris. Looking forward to your support to making this Annual Conference a memorable event. 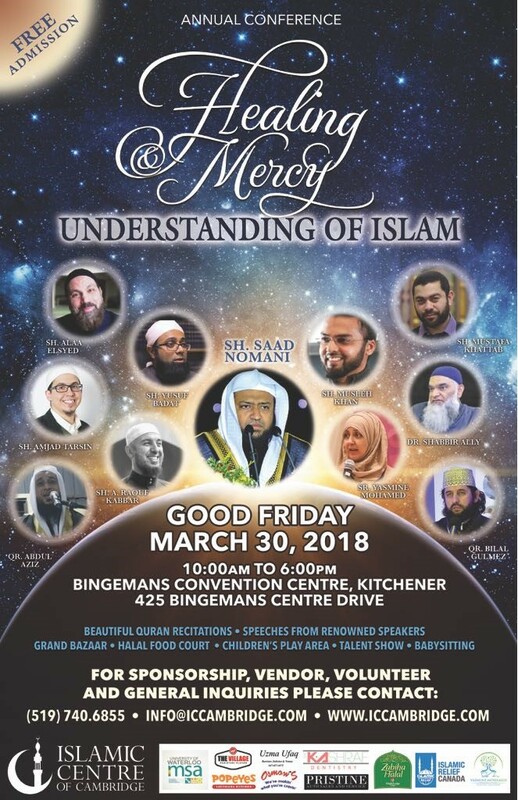 We are pleased to announce that, Qari Saad Nomani (Madina) will lead the Friday Prayer at Bingemans Convention Centre | Kitchener Today's Friday 30-March, 2018 and Khutba will start at 1:30 PM. We are extremely pleased to announce that Brother Khalid Mehmood (Nasheed Reciter from USA) has accepted our invitation to join us Today's Friday 30-March, 2018 at Bingemans Convention Centre | Kitchener. Scholar Shabbir Ally will give a Sermon at Brantford Mosque at 1:30 PM on Greenwich Street on Friday so feel free to attend. Brother Kamran Chaudhary (Former Director of ICC) requests everyone to make dua for his mother and she is currently in the hospital undergoing an operation. May Allah give her a speedy recovery. Today we have a Guest Speaker in our Centre for Friday prayer, Dr. Mustafa Khattab is the Imam of the Anatolia Islamic Centre & Muslim Chaplain at Brock University. He received his Ph.D., M.A. & B.A. in Islamic Studies in English with Honors from Al-Azhar University and also a member of the Canadian Council of Imams. Lecturer of Islamic Studies in English at Al-Azhar University & Fulbright Interfaith Scholar and he has served as An Imam in the U.S.A & Canada Since 2007 & is a published author so his most celebrated work is The Clear Quran: A Thematic English Translation. Dr. Mustafa Khattab will be delivering a lecture after Maghrib today so please join us with your family members and friends. Good Friday | 30-March, 2018 for an all day long program & ICC will have it's Annual Conference with several well-renowned Speakers & Qaris and to avail Sponsorship, Vendors & Volunteer opportunities so contact the office. We need Volunteers for our Good Friday | 30-March, 2018 event so all interested people can fill up the Online Form which you will be receiving in today’s Friday announcements email. Please click the link below & simply fill out the questions and then click submit. We are pleased to announce that, Qari Saad Nomani (Madina) will lead the Friday Prayer at Bingemans Convention Centre | Kitchener on Friday 30-March, 2018 and Khutba will start at 1:30 PM. We are extremely pleased to announce that Brother Khalid Mehmood (Nasheed Reciter from USA) has accepted our invitation to join us next Friday 30-March, 2018 at Bingemans Convention Centre | Kitchener. The YMCA of Cambridge Women’s Group is offering a Free Ladies & Young Girls Club at the Islamic Centre of Cambridge on coming Thursdays 29-March, 2018 from 10:00 AM to 12:00 PM so please feel free to join it. Brother Azwar Halaldeen, a long time Cambridge resident has passed away & his funeral took place yesterday. ICC is arranging a recitation of Quran for his departed soul on coming Sunday right after Zuhr at 2:00 PM so please come and join us of the sake of Allah. Please remember Sister Ufaq Uzma’s Mother in your prayers, who passed away yesterday in Pakistan (Inna Lil'lahi Wa'Inna Allayhi Rajioon). Mark your calendar for Good Friday | 30-March, 2018 for an all day long program & ICC will have it's Annual Conference with several well-renowned speakers and to avail Sponsorship, Vendors & Volunteer opportunities so contact the office. Please find below the "Good Friday | 30-March, 2018 Conference Volunteer Form" so those who are interested, please click the link below & simply fill out the questions and then click submit. Please do not park your vehicles in Armenian Centre during Friday prayer. Please note that, the tax receipts for 2017 are available now for this year tax return & all the receipts are in the school building lobby so please help yourself to find your receipts sorted according to your last name and if you need any further help, please contact to the office. Quran Khawani will be held at ICC in Hall B on Saturday 10-March, 2018 after Zuhr prayer and food will be served after Asr prayer. Please note that, the tax receipts for 2017 are available now for this year tax return so please contact to the office.